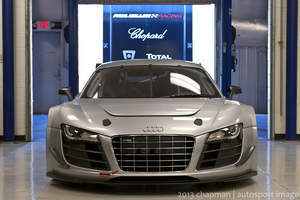 Partnership with Paul Miller Racing extends "relationship from showroom to the track"
Audi Sport customer racing announces Paul Miller Racing as the latest race team to contest the 2014 TUDOR United SportsCar Championship in an Audi R8 LMS. Paul Miller, owner of the Paul Miller Audi and Paul Miller Racing, will campaign the 2014 inaugural season in the GTD-Class starting with a test at Sebring November 16th. "Paul Miller has been a trusted business partner and avid supporter of the Audi brand for many years. We look forward to supporting Paul Miller Racing and wish him and his team much success competing for the podium," said Scott Keogh, President, Audi of America. "Everyone at Paul Miller Racing is looking forward to racing with Audi in the new IMSA TUDOR SportsCar Championship," Paul Miller said. "We also want to extend our thanks to Audi of America. We have had a long and great relationship with Audi, and they will be our partner in this effort. That was certainly a key element in our decision." Bryce Miller, Paul Miller's son and a former GT race winner in both ALMS and GRAND-AM competition, will return as a team driver, partnering for the season with a to-be-named driver. An Audi factory driver will attend the first test in Sebring on November 16th to prepare for the season opening ROLEX 24 at Daytona. "We are delighted to have such a strong partner representing the Audi brand both on the track and at Paul Miller Audi. Having the same level of professionalism and drive to succeed on the track is certainly what has made him a Magna Society Award recipient the past several years," said Mark Del Rosso, Chief Operating Officer, Audi of America. "We are excited to extend our relationship from the showroom to the track." The Audi R8 LMS race car shares more than 50% of its parts with the Audi R8 street car including the naturally aspirated V10 5.2 Liter engine, the Audi Space Frame and a variety of other components. Having won all of the major 24 hour races around the world, including the 2013 ROLEX 24 at Daytona, owners of the Audi R8 street car can be confident in its race-tested performance and durability. Of great benefit to the race teams is the first service interval at 12,000 miles under race conditions which translates into considerably lower operating costs. Paul Miller Racing is based in Buford, Georgia and Parsippany, NJ. The team's technical operations are year round and official team testing is primarily conducted nearby at their home circuit Road Atlanta. Paul Miller Racing is among the top GT teams competing in North American sports car road racing. In 2014, the team will contest the full GT Daytona (GTD) season in the new IMSA TUDOR SportsCar Championship in a new partnership with Audi Sport customer racing. Bryce Miller will drive the No. 48 Paul Miller Racing Audi R8 LMS with a to-be-named co-driver. The racing team is affiliated with the Paul Miller Auto Group, which has operated Paul Miller Audi since 1976, races in support of Full Circle Home, and competes with the support of TOTAL Lubricants, Search Marketing Group and Motegi Racing. Follow Paul Miller Racing on Twitter @paulmilleracing @bryceracer and become a Facebook fan at Facebook.com/paulmillerracing and Facebook.com/brycemiller.net. Learn more about the team at www.paulmillerracing.com.